Diego Figueiredo is an extraordinary, fast-rising star among the world’s greatest jazz guitarists. He provides a new, fresh approach to uniting technique and emotion in a fusion of Brazilian music and jazz. His superb technique, timing and imagination have made him one of the hottest international names on the scene today. His concerts have been a great success in more than 50 countries around the world. Diego has released 23 CDS, 3 DVDs and a book, and he has received awards at the Montreux Jazz Festival as one of the greatest guitarists in the world. A brilliant musician who keeps the tradition of the true essence of Brazilian music, at the same time he can be modern and innovative, Diego teams-up frequently with tenor saxophonist and clarinetist extraordinaire Ken Peplowski to deliver a lively, updated look at the Bossa Nova sound. Ken Peplowski has recorded approximately 50 CDs as a soloist on both tenor saxophone and clarinet, and close to 400 as a sideman. He toured with Buddy Morrow’s edition of the Tommy Dorsey band, where one of his section-mates was Sonny Stitt, with whom he later studied. “I love all kinds of music, and I’d like to find more opportunities to bridge the gaps between different musical styles,” he says. “I consider myself an interpreter of material – if something interests me, I try to put my own spin on it, without thinking or worrying about playing in any particular style.” Now based in New York, he fulfills that vision by playing everything from Dixieland to avante-garde jazz. 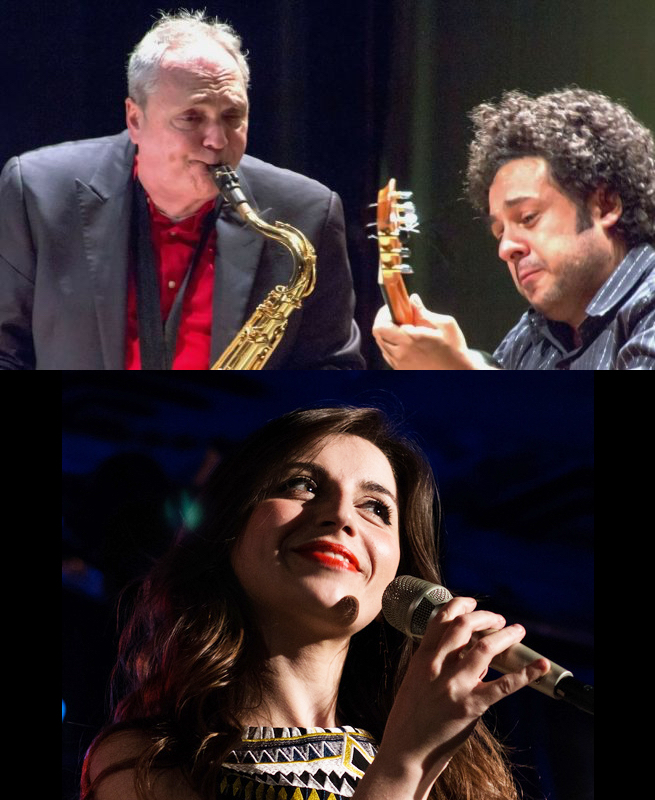 Special guest at this concert will be award winning Italian singer/songwriter Chiara Izzi, who was described by Jazz Times as “a talent to be heard, admired and anticipated.” Chiara’s sound is based on her own unique interpretation of a fusion of different genres, including jazz, pop and Mediterranean sounds. A bold and fluent interpreter of Brazilian music, Chiara’s international debut took place at the Montreux Jazz Festival Vocal Competition in 2011, where she was awarded first prize.